Revisit our 2012 interview feature with Melissa Mailer-Yates and marvel at her wonderful “Brave New World” art – Which is still available as a print here.. Please click below to read. 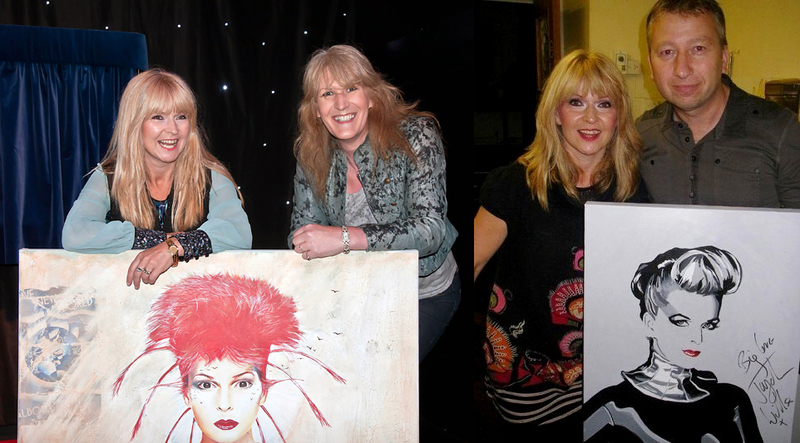 There’s s good selection of photos, from Monday’s ‘King’s Heath Walk Of Fame’ event at Gig Junkies, including Toyah, Robert Fripp and Melissa Mailer-Yates (with the fantastic ‘Changeling’ painting – more on that here). Neon Womb, It’s A Mystery , Thunder In The Mountains, Brave New World? Are bells ringing down memory lane? Our interview feature with Melissa Mailer-Yates is now online. Please click below to read. Melissa Mailer-Yates: Talks Toyah & Much More TODAY! Return later today to view FTE‘s Melissa Mailer-Yates interview feature. It’s a great read, with Melissa talking art, her career, Toyah and a lot more! This is also the final Toyah-related feature from me but a great one to finish with… View info on The Changeling prints. • View FTE‘s other recent features: The Changeling Resurrection Review; Stevie Bray: The Original Toyah Drummer Interview; Toyah: Thru A Photographer’s Eye. Melissa Mailer-Yates: Interview Feature – Coming Soon! Coming Soon! An interview with Melissa Mailer-Yates. Discussing art, her career and Toyah! An update on ‘The Changeling’ prints by Melissa Mailer-Yates. Melissa has revealed that these will be a limited edition run: There will be just 312 prints made available, marking the 30th anniversary of ‘The Changeling’ in 2012. More info on the prints here. The incredible The Changeling/Brave New World art by Melissa Mailer-Yates is now available to purchase by print: When asked by the artist for her favourite photograph from the 1980s Toyah chose the wonderful image from ‘The Changeling’. The resultant painting inspired by this awesome picture was displayed at the premiere of ‘The Power Of Three’ movie in London, November 2011. The production of a print was discussed, and Toyah chose the hospice which cared for her mother, St Richard Hospice, as a beneficiary from the sales. This giclee print is the result of that discussion and is available in two sizes, 18″ x 18″ and 26″ x 26″. It is printed on a thick, heavyweight watercolour paper (190 gsm), with a textured matte surface giving it the look and feel of a stunning original work of art. Both inks and paper are archival quality. Each print is produced to order, and is individually signed by the artist. Postage and packing is included in the price, and will be dispatched as soon as it is ready.